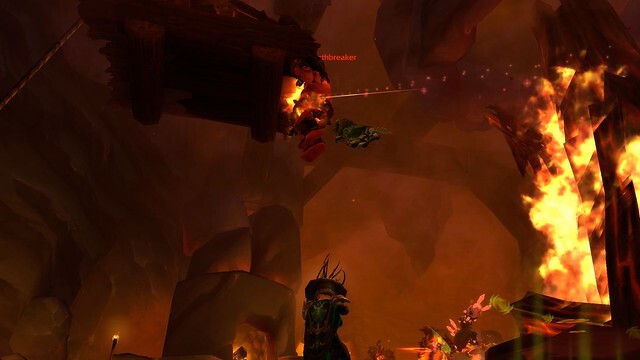 Five-man instances have been a part of WOW since inception. One of the eight 5-mans in Warlords of Draenor is Bloodmaul Slag Mines. There's lots of fire. On the way to Forgemaster Gog'duh, you'll find an ogre, on fire, hanging from a platform. In a normal running of this, you don't have to concern yourself with this guy, so you might not even notice him. In the heroic version, however, you need to knock this guy down to stop the spawning of fire elementals. He doesn't have that much health and a ranged dps can take him down easily. One of the crazy things about hunter pets is that, unless they are tanking, they will automatically go to the rear of the NPC they are fighting. I was not aware Quilen could fly, but I guess I was wrong.